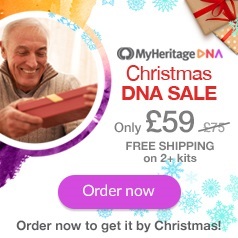 MyHeritage DNA is offering discounts on its testing kits. You'll find the current deals for the UK/Ireland and USA below (I can't access the sites for other territories). But while advising these offers, I also want to remind researchers that another saving is still available to those who've had an autosomal DNA test with a company other than MyHeritage. If you upload your raw DNA data to the MyHeritage site before 16 December, you'll receive a free ethnicity report (a breakdown showing the percentage of DNA you get from various regions around the globe) and cousin matches, and you'll continue to have full access to the site's DNA features for free in the future. Hundreds of thousands have taken advantage of this offer since My Heritage started offering DNA tests last summer; its database now holds the data of nearly two million people. When this current offer expires, you'll still be able to upload your DNA data for free, but you won't get a report or any cousin matches without a charge. I've taken up the offer, by downloading my raw dna data from Ancestry and uploading it to MyHeritage. It was easy to do... much easier than I'd expected, so don't be put off for fear of the process being complicated. It really isn't. Start here. It's also very quick. The ethnicity reports and cousin matches arrived within just a few days. UK and Ireland – MyHeritage DNA test kit reduced from £75 to £59. Shipping is free for two or more kits. Offer ends Sunday 16 December. USA – MyHeritage DNA reduced from US$79 to US$49. Offer ends Sunday 16 December.